I fully acknowledge that this might be a little crazy (in the OCD category). 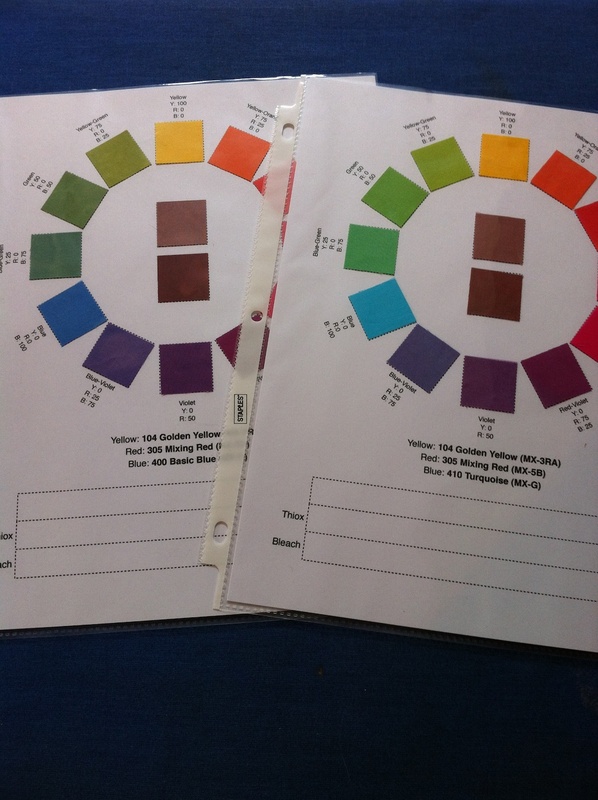 I'm only planning to dye the primaries, secondary, and tertiary colors, and I"m only dying a single value of each hue. Yes, there will be duplication from one color group to the next. For example, the same yellow will be crossed with multiple reds and blues. Produce a reference that shows how the primaries interact. Identify primary triads that speak to me and merit further exploration (Soderlund color cube?). Develop color palettes different from the one that have become habitual to me. So why am I doing that? Well, in part it's because I can't seem to resist doing it. Yes it's lots of work, but the discovery will be fun. And, the end result will be useful. The dyeing plan is a little convoluted. After a couple of sessions where I dyed one or two color families at a time in small containers I realized that, while this was the easiest approach to organize, it was also the most wasteful. I would be spending most of my time mixing dye. Instead, I've developed a whopping big spreadsheet that allows me to identify every combination of the 4 yellows, 4 reds, and 5 blues--that makes 80 distinct color wheels--and shows how many 5"x 5" squares of each distinct YR, YB, and RB pair that I need to dye to assemble the wheels. 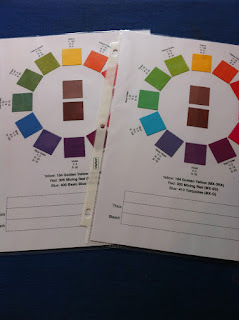 Once all of the dyeing is done I'm also going to do discharge samples to accompany each color wheel.